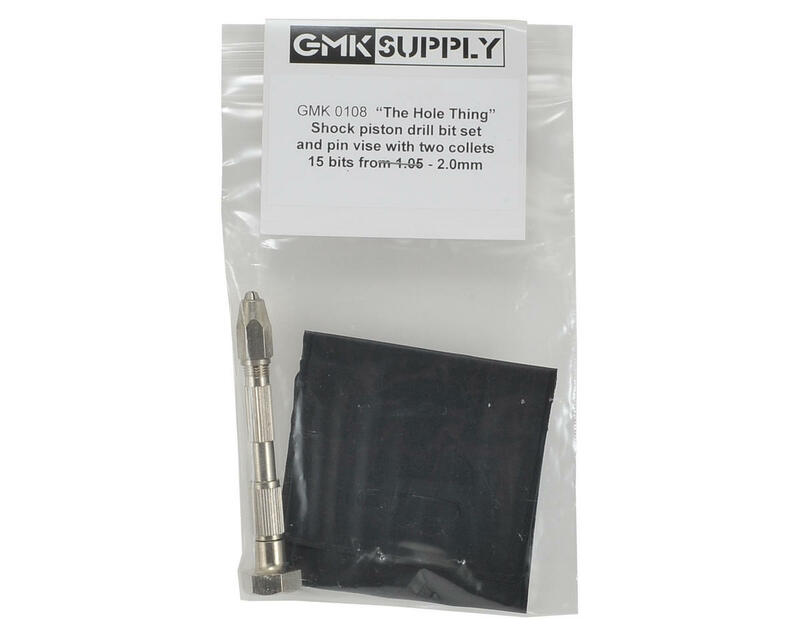 This is "Hole Thing" shock piston metric size drill set from GMK Supply. This shock piston drill set includes drill bits from 1.05mm to 2.0mm in 0.5mm increments! 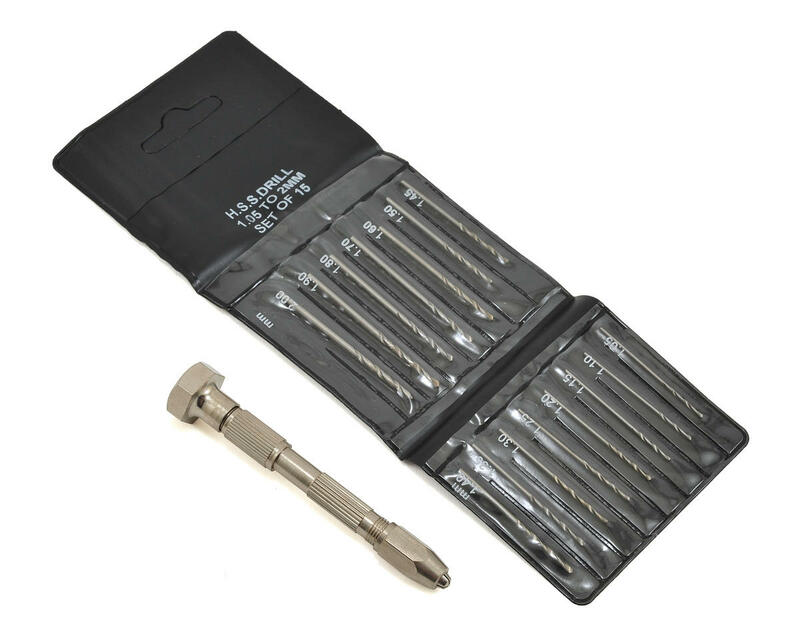 Also included in this kit is a pin vice for holding the drill bits, as well as two collets for adjustability. This is the perfect tool for customizing your shock pistons to exactly the size you want! Hi Scott - Thanks for purchasing one of my drill sets, and for taking the time to write a review. The pin vise included in the set includes two collets, and each collet has two ends with different clamping ranges - so a total of four collet sizes are included. Between those four sizes, every drill bit in the set can be gripped. The second collet is stored under the swivel on the other end of the pin vise - you may not have realized it was there. Note - To submit this review, the software requires me to make a rating. I wouldn't ever just come on and rate my own products highly - I just wanted to see if I could help Scott out with the issue he raised. Very nice set bits a very sharp and strong. There are two different adapter collects stored in the handle that have four sizes one on each end of the collect to fit all the drill bit size. Handle has a solid feel with a rotating top cap that help when applying pressure to cut thru your materiel. The bit must be lock in with the tightening nut very tight or the bit could slide down into the collect. I would recommend this product I like it and it got the job done well and very precise. Perfect set of drills to do pistons of any size. And all the correct parts are there, you just need to be smarter than the tool. There is no reason anyone should give this anything less than 5 stars. I was even able to chuck the handle up in my drill to speed the process of drilling the holes out. I could not get the collets tight enought to actually hold the bits in place, the hand drill piece is also different than pictured. And yes I used all four collets. Works fine except the 1.7 bit is missing. Got 2 1.9 bits instead. To echo other's views on this item, the drill bits are fantastic and the little case they come in is extremely useful. However the pin vise leaves a lot to be desired. You can widen the collet a bit in order to accept the in-between sizes but it is a bit frustrating to do so. I would prepare to buy a different pin vise to complement this kit. Otherwise it did what I needed it to do, once I manually widened the collet. Just want to add another confirmation that there is nothing wrong with this kit. The people having problems must have missed the fact there is another collet in the handle. I just used mine, and tried many different sizes without issue. Very impressive quality considering the cost and completeness of this kit. Is good shock piston drill. I love it. Guys..the manufacturer is completely right here. Everyone seems to be a little quick to leave negative feedback on this item. The collet that fits the rest of the bits is located in the handle. This then provides four (4) separate collets that will fit every bit included in this kit. The kit is perfect. Everything included to take care of pretty much every metric piston hole you'd want to drill. Nice product that comes with a nice little pouch and zip lock bag to hold everything in. Don't be afraid to buy it based off of the previous negative reviews. Gotta be smarter than the tools you use. I have the same issue as the two people that already reviewed the product. There is only one side of the supplied collets that accept the drill sets, a shame. The drill bits are great! As it was mentioned before the hand drill seems to have trouble with bits in the in between sizes. For the 1.6, I used the 2nd largest collet and hand tightening held in in place but when I tried to use it, the bit slid. I needed to use an adjustable wrench and a needle nose plier to get it tight enough. Which of course, left marks on the handle. Not a big deal, but a little annoying. I normally don't bother with reviews, but this thing is junk. Like others have said, the drills are fine, but the pin vice/handle thing is COMPLETELY useless. It comes with 4 collets and none of them fit the 1.4 to 1.8mm drill sizes. The sizes I use most often. I see the manufacturer left a 5 star review saying that there were 4 collets and the other reviewer must not have known that. Well, I'm telling you the collets are not sized right and the ones that do fit are so poorly made that the holes in them are not straight and the drill wobbles so bad i can't even imagine trying to make a precision hole with it. Complete junk! Just avoid this unless all you want is the actual drills. I wish I could give zero stars. The drill bits in 0.5mm increments are great!!! The let down is the hand drill which does not accept ANY of the supplied bits that i needed to use. It seems that to suit drill bits sized between about 1.2mm and 1.5mm, neither collet will work as the nut to secure the bit will not reach the thread to allow it to be tightened... Great bits, poor design of drill.